You have a great opportunity to sink into amazing world of Lego City, where you should control the helicopter and save as many people as possible. Have so much fun here. Just use the arrow keys to move and you will be not disappointed. Have you seen that? In this game you are going to save all the people! 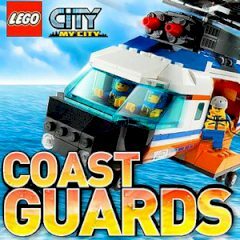 Just join to a coastguard patrol in the Lego City, where daring rescue expedition are on the agenda of day. Could you believe that? Then do not waste your precious time and save them as soon as possible. You will have to use a Coast Guard helicopter and go rescue shipwrecked before sharks. Is everything clear? Then this is your chance to show us how cool you are. Just enjoy the game and you will love it. We wish you good luck right now.